Weather to shear. The whether-or-not depended on the weather and as we’d ‘enjoyed’ le temps pourri (rotten weather) since some super days back in March, I thought the sheep would be glad to hold onto their outdoor coats. Their summer-wear, like our own, was left safely in a suitcase in the attic. I have to admit an ongoing apprehension as shearing approaches. 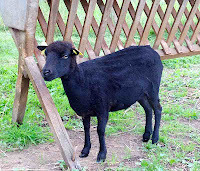 I have got a British Wool Marketing Board blue certificate (three sheared correctly under the examiners eyes in half-an-hour) but our pint-size local breed Ouessants seem too small for the Bowen-method moves. 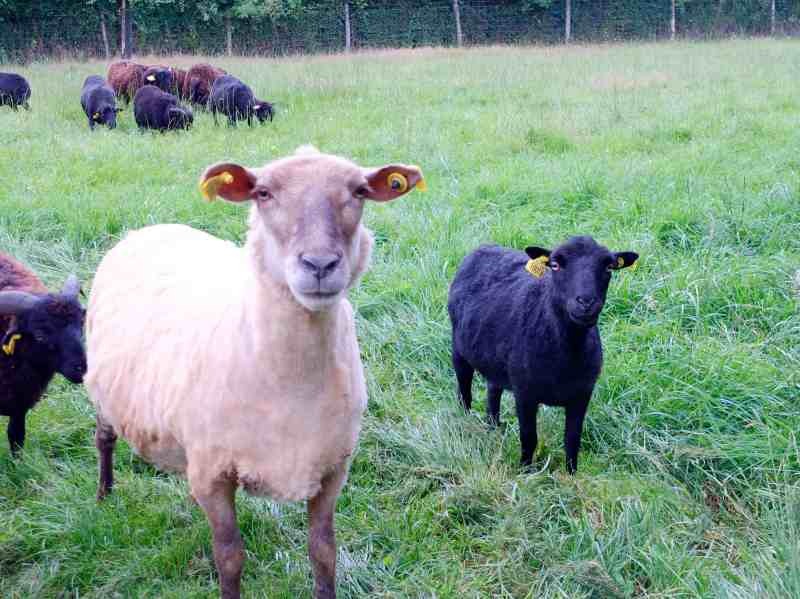 The other aspect of my apprehension is the risk of cutting the sheep. 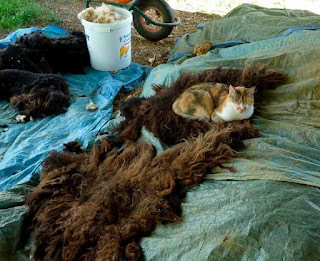 One must avoid the temptation to push wool away, which can tent the skin leaving it vulnerable to the next ‘blow’ of the shears but rather pull the skin towards oneself, so flattening it out. The odd graze, like the shaving cuts my Dad used to cover with a tiny square of tissue, is OK but a few years ago, I did cause a little wound in the soft skin under the ‘armpit’ of one young chap that necessitated taking him down the vet’s for a couple of stitches, not great for my self-confidence. As I only do around a dozen a year, I haven’t built up a high level of confidence through familiarity. I’m better once I get started but the bad weather played to my procrastination. 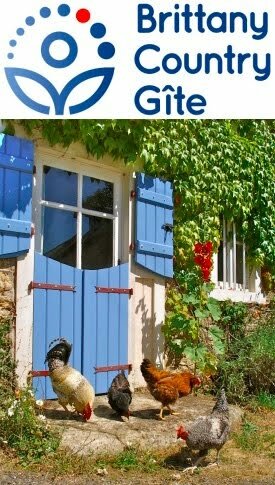 I’ve checked my notes and I sheared in May (2009) then early June (2010) then mid to late June last year and this year is was mid July when la météo confidently announced a string of hot days coming up. The later dates weren’t about my reluctance but more an experimentation to try and find the optimum time to shear. Received wisdom is that the strands of wool get a break point in them at a certain time of year and that hot weather makes the sheep produce more lanolin which also helps shearing. I have noticed that some of our sheep are easier to shear than others. Last year, my very last one, when logically I’d be at my most tired and the clipper combs and cutters at their bluntest fell off it as if I’d suddenly turned into an Australian champion shearer. There’s another issue, which is that of flystrike, where a (certain type of fly) lays it’s eggs on a sheep, whose maggots then start burrowing into the poor beast. 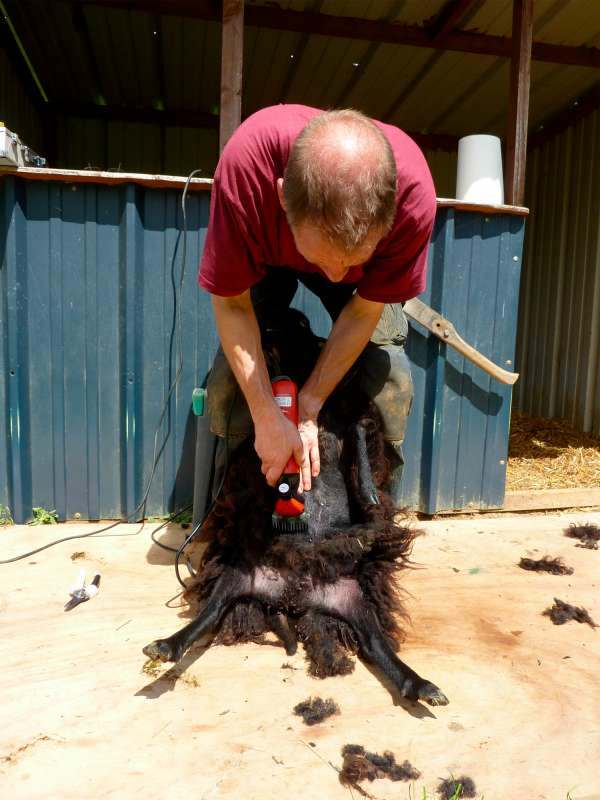 Animals are particularly at risk between April and October when the weather is warmer but recently shorn sheep are seldom struck which is therefore another reason to shear as soon as one can when it gets hot. Habitually, I’ve borrowed some Heiniger electrical clippers off a neighbour but wanted to have our own and I bought a Zipper from Horner Shearing. It still has the motor in the grip, like the similar models from Heiniger and Lister, but it is slimmer in the hand, giving more control and it shears like a dream. Bearing in mind it’s only rubbing a cutter over a comb, I don’t understand why it is so good but it’s a bargain at the price and I can’t recommend it enough. Confidence in one’s tools helps a great deal. In all the waiting the sheep, some more than others, had begun to shed wool and were looking quite clean around the belly and neck. I had high hopes that these would be the easiest to shear but it turned out that the two ewes who’d shed the most had managed to felt the wool themselves and, after a bit of a fiddle, it came off like a rug. Nothing to do but throw it down somewhere and after no more than five minutes, the cat sat on the mat. All done in a day and not a single nick, I think I might just be getting the hang of this. Well done! 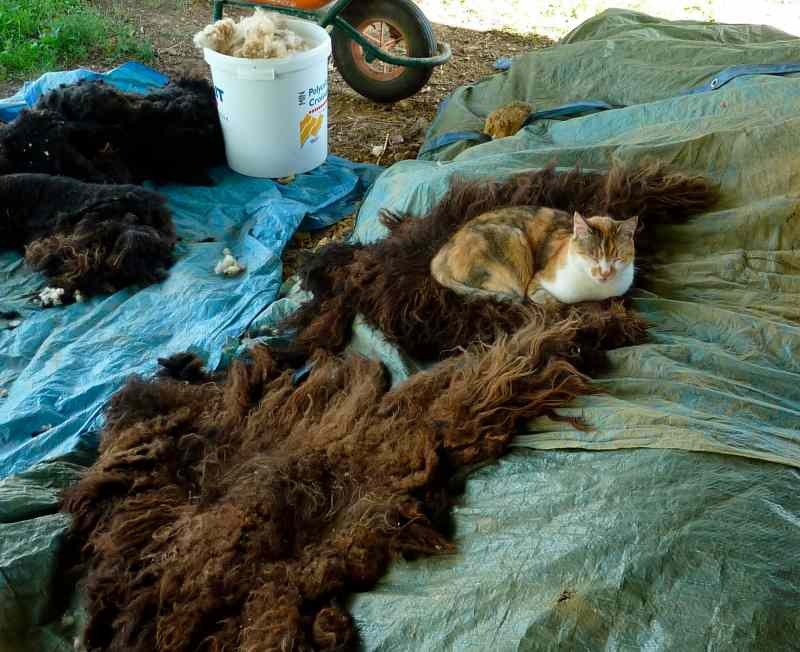 What do you do with the fleeces? Well done! 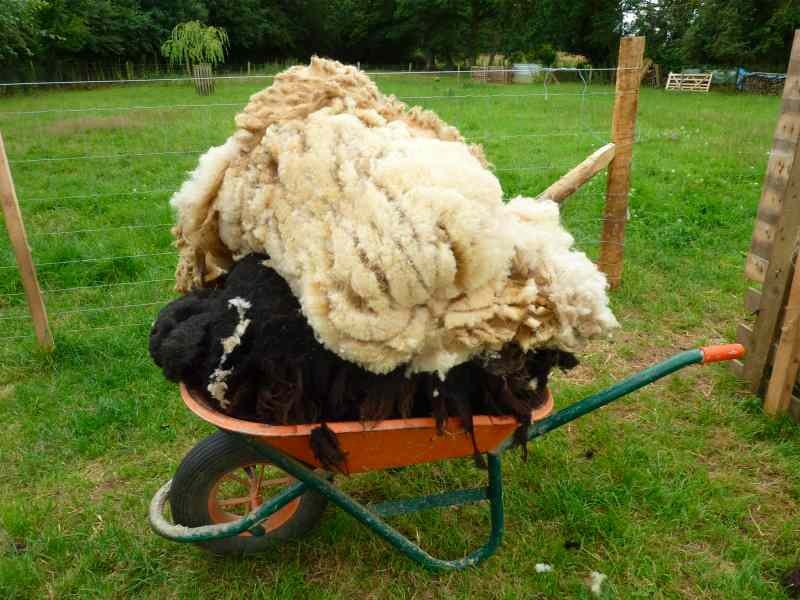 My only tip is to sit down whilst shearing them as its back breaking otherwise! 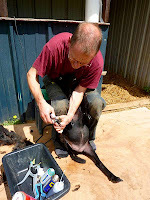 I have a super shearer who does mine and never nicks them.....which is remarkable with all the wriggling! Hi Val and Coco, thanks for your comments. Val, you can see, just behind my legs, a garden kneeler/seat hard up against the sheep shelter. At different parts of the Bowen 'waltz', I sit down, my back supported by the wall. It's not ideal but does help. 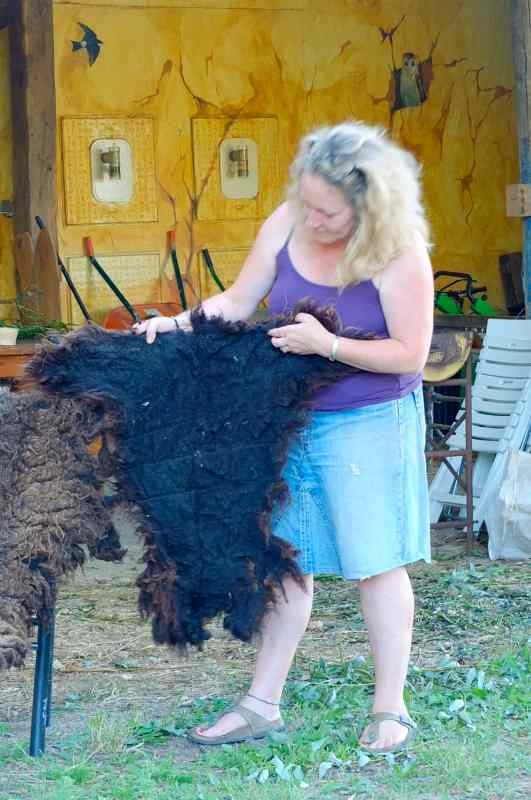 Coco, my wife Gabrielle sorts through the wool and the best gets washed, hand carded and felted. Val gave us a spinner and one of our volunteers taught her how to spin but it's very time-consuming; we did get enough yarn for my mum to knit me a hat though! The rough shoddy gets used as a slug suppressing mulch in our vegetable patch.